Start from the edges, take territory with the highest value, know when to give up are the three main principles of go, a game about staking out and capturing territory. And that’s exactly what is currently happening between the two major international watch events, Baselworld and the SIHH. all but dominated the central territory of the goban (the go playing board) with its 361 intersections. Meanwhile, the Swatch Group, master of another central territory, seemed to have dealt a fatal blow to Baselworld by implementing the third principle of go: “Know when to abandon your position”, thus leaving an enormous void by pulling out. The territories of power players Rolex and Patek Philippe, as well as those of other venerable actors like Chopard, still seem to be holding strong. Geographically positioned on the edge of the goban, the LVMH brands appeared to be undecided, as did the hallowed domains of Breitling and Chanel. Were they about to go over to the enemy? There came a surprise announcement that completely turned the tables. The two adversaries announced they would form an alliance, in the form of a chronological rapprochement from 2020 (the SIHH will run from 26 to 29 April in Geneva, followed immediately by Baselworld, from 30 April to 5 May). The game would thus be declared a draw. But, according to the rules of go, there can be no draw, thanks to the komi, a compensation bonus including the only half point it’s possible to score in the game. So someone always wins, even if by just half a point. Who will win the current game? Baselworld, which many had thought was in its death throes? The SIHH? Why should anyone in the Carré des Horlogers or in the lavish hotel suites near the lake bother to exhibit in Geneva, if they’re going to Basel immediately after? The Swatch Group, as the distant observer? But as long as Rolex, Patek Philippe, LVMH, Chopard, Chanel and Breitling stand firm in their Basel territory, the game of go will not be over. The Patented Woodpecker Neck Regulation: Precision in even the toughest of conditions Wearers of our watches need to be able to rely on them at all times. This is why our team at MĂźhle-GlashĂźtte always goes above and beyond what is actually necessary. We developed our fine regulation in 2003 in order to ensure the accuracy of our movements in even the toughest of conditions. Take a closer look On paying closer attention it becomes clear that the singular resonance of this piece comes not only from its perfectly centred geometry, but also, and perhaps mainly, from its typography. Not one figure, not one letter is like another. Each one is unique, and slightly different from all the rest. And that’s because it is all done by hand. The lettering is the work of one of the manufacture’s designers, adopted and replicated exactly on the dial. It was a rather inspired decision, taken by Thierry Stern himself, we’re told. And it’s probably the lettering that immediately sets the vintage tone of this watch. But it’s a kind of vintage that we haven’t seen before, embodied in this unique display with its discreetly poetic interpretation of hand lettering, its whiff of calligraphic nostalgia. It is all done by hand. The lettering is the work of one of the manufacture’s designers, adopted and replicated exactly on the dial. CALATRAVA SEMAINIER REFERENCE 5212A-001 Dial: Silvery opaline, blackened gold applied hour markers. Blackened white gold two-face dauphine hands. CASE: Steel. Diameter: 40 mm. Height: 10.79 mm. Water-resistant to 30 m. Sapphire crystal case back. Strap: Calfskin, hand-stitched, light brown, prong buckle. Displays: Hour hand, Minute hand, Second hand, Day hand, Week number hand with corresponding month. Aperture: Date. Correctors: Day-of-week correction. Week number correction. Poinçon Patek Philippe. tion, and thus requiring additional adjustment, with high-tech components. Thus, the traditional uncoupling yoke has been replaced by a new patented clutch wheel (the result of a highly complex manufacturing process, we are told) that drives the mainspring barrel in one direction and uncouples it in the other. Another optimisation is the addition of a reduction wheel that is uncoupled from the automatic winder when the watch is wound manually. Multiple efforts to reduce friction, and thus increase performance and reliability, all combine to make this movement what it is. (because, every five to six years, a year has 53 weeks rather than the usual 52 – the next time this happens will be in 2020) is driven by a second seven-pointed star with an extended Sunday tip, which starts off the new week on a Monday, in accordance with the ISO 8601 standard (see sidebar). In order to avoid energy consumption peaks (the automatic movement has a power reserve of at least 35 hours, up to a maximum of 45 hours) the calendar displays advance semi-instantaneously in discrete steps. Another important point is that, as a so-called “useful” complication, it should deserve its title. Accordingly, the safety features implemented by the movement’s designers allow the user to make the necessary corrections at any time of the day or night. For the weekday and number, adjustments are made via two pushers placed at 8 o’clock and 10 o’clock respectively. The date is corrected on the crown (pulled out halfway – the maximum extension is used to stop the balance in order to set the exact time). It bears repeating: this Calatrava Weekly Calendar is successful in every respect, and certainly has a promising future ahead. After all, as people sometimes also say: “God is in the detail”. WHAT ARE THE CHANCES OF SEEING A PERPETUAL WEEKLY CALENDAR? The week numbering system is defined by ISO standard 8601. Created in 1988, and based on the Gregorian calendar and the 24-hour system, this standard describes a “way to represent dates and times using numbers”, which also extends to numbering the weeks. The numbering system is mainly used for logistical purposes in industry, business and IT. According to this internationally recognised ISO standard, the week begins on Monday, the days are numbered from 1 to 7, week 1 is the week that contains the first Thursday of the year, and the last week is the one that contains the last Thursday of the year. But, as Wikipedia explains, a year generally contains 52 weeks of seven days, but that makes a total of only 364 days. Because a year in fact has 365 and one-quarter days, the date of the first day of each week goes backwards by one day from one year to the next (two days, for a leap year). If we didn’t have a 53rd week from time to time, week 1 of the year would end up in the previous year. So here’s a question for watchmakers: given that the 53rd intercalary week only makes an occasional appearance, what are the chances of being able to create a mechanical perpetual weekly calendar? If we take a few real-life examples, it looks like quite a head-scratcher: in 2020/21, 2026/27, 2037/38 and 2048/49, week 53 will begin on Monday 28 December, and end on Sunday 3 January; but in 2032/33 week 53 begins on Monday 27 December, and ends on Sunday 2 January. Get your thinking caps on. A snapshot of the American watch market In the United States, as in most parts of the world, we saw something of a catch-up effect in 2018. But behind the scenes, the fundamentals of the American market are in turmoil, as a result of the growth of the smartwatch, the concentration of retail in European hands and the strong growth of the secondary market, thanks to the internet. America: Trump, the great outdoors, the dreams and the violence, the grandeur and the misery... and also the firepower of Apple Watch and Rolex, as well as all the evolutions that usually take root here before reaching the rest of the world. We spend a good part of the year in the United States, reporting case studies, testimonies, observations, watchmaking news and opinion, which we are presenting to you in this special report dedicated to the American market, and to watchmaking Made in the USA. But can a country that has lost its once-great industry still be a watch nirvana? We have gathered comments from various voices, on our road trip through the highways and byways of American watchmaking. in North America since 2015. However, it doesn’t seem to have impacted the traditional luxury mechanical watch market. On the contrary, “fine mechanics” were on the road to recovery in 2018, a catching-up effect observed in both the US and in Asia. With more than 2.2 billion francs of Swiss watch exports to the United States last year, the market grew by 8% and is approaching the results of 2015. To sum up, one could say that the “volume” market seems to be gradually moving towards Apple, while “value” remains firmly anchored among the traditional Swiss brands. Faced with the mighty Apple Watch, large American groups active in the entry-level watch segment, such as Fossil Group and Movado, are launching a counteroffensive with their own connected products. Richard Mille boutique in New York – its largest in the world – also marks the opening of a new era for the brand. Would the emergence of the internet encourage online sales of smartwatches? Or of ultra-contemporary models? Neither, in fact. The first segment to benefit from the arrival of e-commerce has been the socalled “grandfather’s watch”, secondor even third-hand, on a market that is still often greyish, fuelled by genuine vintage timepieces, but also by the effects of an overproduction of watches, via so-called preowned models, in reality often “never-worn”, at fire-sale prices. The online watch sales landscape remains something of a jungle, but clearings are starting to appear. In this respect the United States, the cradle of digital technology, is acting as a pioneer, but it needs to be closely monitored. Beyond Amazon or eBay, major players specialising in the sale of secondhand luxury watches have set up shop. WatchBox has just opened an office in Switzerland, and there’s also True Facet. The latest step is to bring the online secondary market closer to authorised retailers and brands. WatchBox has set up a partnership with Californian retailer Hing Wa Lee, and its arrival in Switzerland is also related to its desire to offer brands a direct channel to the secondary market. The historic American retailer London Jewelers has established a partnership with the pre-owned platform Crown & Caliber. Having just raised $10 million in venture capital, True Facet is working with Silicon Valley retailer Stephen Silver, and also directly with brands such as Raymond Weil and Fendi. It’s the huge and impersonal shopping malls, which multiplied in the 1990s in the United States, that are under the greatest threat. A second major upheaval in the United States is the evolution of retail structures. As everywhere in the world, a significant proportion of brands intend to combine opening their own stores with controlling online sales to lock their distribution. The most recent cases are those of Richard Mille and Audemars Piguet, which both left the SIHH trade show at the same time. The recent opening of a Richard Mille boutique in New York – the largest in the world – also marks the opening of a new era. Audemars Piguet, meanwhile, intends to abandon distribution in multi-brand outlets within three and a half years, according to its CEO François-Henry Bennahmias. In the United States, there have been many closures of traditional small to medium-sized shops. We also see a growing concentration of distribution in a handful of powerful European chains that remain very close to their bestselling brands, such as Rolex, a dominant brand in the United States. We have observed the takeover of the Tourneau chain by the Swiss retail giant Bucherer, and that of the Mayors chain by British retailer Watches of Switzerland. As for Germany’s leading retailer, Wempe, it is firmly established in New York with a store on Fifth Avenue, as well as a space that the retailer operates for Rolex. All are attracted by the promise of a market that could grow in absolute numbers. Looking beyond watchmaking, the American retail sector has been under strong pressure for more than a decade now. Several hundred branches of department stores such as Macy’s, Sears, Kmart and J.C. Penney are in the process of being liquidated. giants Toys “R” Us (toys) and HH Greg (electronics) have declared bankruptcy. Payless (shoes) and Rue 21 (clothing) have managed to restructure, but only after having been forced to close many outlets. RadioShack, a long-established chain of electronics stores, filed for bankruptcy before being bought by an investment fund. A rather gloomy picture, then. a half times the size of the United Kingdom in terms of watches. You can see the growth potential.” The group is owned by Apollo Global Management, which is expected to go public in 2019, according to several sources. A real giant is setting foot in the United States. Earlier in the year, Watches of Switzerland swallowed up the Mayors jewellery and watchmaking chain, which operates in Florida and Georgia through a network of 17 stores (including one operated for Rolex): “Thanks to the acquisition of this more than 100-year-old company, we are learning a lot in preparation for our expansion in the United States,” says David Hurley. er in the United States, with more than twenty sales outlets around the country. Tourneau had also strongly developed sales of pre-owned watches and e-commerce, two fastgrowing segments. Bucherer, being very close to its longstanding partner Rolex, did not miss this opportunity to dip its toe into the American market, which could further strengthen the crown brand’s dominance in the United States. The family business from Lucerne will also have the opportunity to develop its own brand, Carl F. Bucherer, on the US market. Since then, the Bucherer group has also acquired Baron & Leeds, another watch retail chain that operates in California and Hawaii, and is also a partner of Rolex. The period of upheaval in the watchmaking sector that began with the 2014 Chinese crisis has therefore fully benefited a giant like Bucherer, whose empire now extends from Europe to the United States. And the American market does indeed seem to be the new playground for major European retailers. For its part, the German retail leader Wempe operates a prestigious boutique in New York, as well as a brand boutique for... Rolex, yet again. Roland Murphy – the last American master ETA movements to offer more accessible watches, such as the 151 model priced at $3,000. The company even offers its vision of Americana through the Baseball Watch model. In the place where the erstwhile giants of American watchmaking, including Hamilton Watch Company, were established, near Lancaster, Pennsylvania, we met Roland G. Murphy. This master watch restorer founded the RGM Watch Company brand in 1992, the only American watchmaker still producing its own mechanical movements. He represents an isolated, independent mind on the other side of the Atlantic, far away from the Swiss ecosystem. RGM Watch Company is housed in a former bank in the small town of Mount Joy, Pennsylvania. It’s a solid brick-built structure with a vintage but still very reliable safe. On the ground floor, three watchmakers are busy at their workbenches. After the tour, the discussion begins with Roland G. Murphy, one of America’s only master clock and watchmakers. “The United States has always been a country oriented towards mass watch production, before everything moved to Asia,” says Roland Murphy. “The large factories in our region operated very differently from our craft workshops. In a sense, I am an heir to this watchmaking tradition, but an heir with a very different face.” He feels closer in spirit to the likes of Kari Voutilainen, Svend Andersen, Peter Speake-Marin or the Grönefeld brothers. However, it was at the Hamilton facilities in Lancaster that it all began for the native of Maryland. Before Hamilton he completed an apprenticeship as a carpenter. During that time he took a job with Danecker Clock Co. where he worked on the wooden cabinets for clocks. When the company went bankrupt, Roland Murphy bought the stock of clocks and began to analyse their movements. This was the beginning of a passion that still grips him today. A pioneer in the “new wave” of independents He joined a technical school in Pennsylvania (which has since closed its doors) to take a watchmaking course, before flying to Switzerland in 1986, where he perfected his skills at Wostep in Neuchâtel. Back in the United States, he was hired by SMH to work on product development for the Hamilton brand in Lancaster. However, Roland Murphy did not really feel at home in a group, where individual initiative is necessarily limited by the many constraints, work meetings and hierarchical superiors. Besides, he missed working with his hands. He decided to leave the group. Hamilton, meanwhile, would relocate permanently to Biel in 2003. At the beginning of the 1990s, there were just a handful of independent master watchmakers, a new generation led by François-Paul Journe, Franck Muller, Antoine Preziuso and Vincent Calabrese – a far cry from the current Carré des Horlogers! When he founded RGM Watch Company in 1992, Roland Murphy was one of the early birds of this “new wave” in watchmaking. In 2007 the RGM Watch Company launched its first in-house movement after seven years in development. Today, the company has four Made in America calibres, for an annual production of some 250 watches. The brand has specialised in the segment of custommade models, a growing niche, as well as in the trade-in of secondhand timepieces against new RGM watches. Fortunately for him, the watchmaker initially acquired a large number of Nivarox assortments via third parties, which he still uses today. The first models were skeletonised column-wheel chronographs equipped with Valjoux movements. With the help of Jean-Daniel Dubois (now director of Vaucher Manufacture), then at Lemania, he was also able to launch several small series of tourbillon, minute repeater and perpetual calendar watches. At the same time, he continues to work as a restorer of vintage timepieces, providing after-sales service in the United States for brands such as Sinn, Eberhard & Co. and Titoni. This supports RGM’s activity as an independent brand, with a dozen employees today. Most customers are American watch connoisseurs. Roland Murphy chose to switch to a 100% direct sales model more than a decade ago, after a series of bad experiences with retailers. “At first, I started by collaborating with retailers, but I realised that it was better to give it up for a small independent brand like mine,” explains the watchmaker. “The major brands give advantages to sellers to ensure their supremacy. One day, a customer went to a point of sale that represented me in California and asked for the price of one of my watches: he was immediately redirected to another brand. This happened three times in three months. Enough to understand that it was no accident.” RGM Watch Company took the drastic step of withdrawing from the dozen or so points of sale that represented it in the United States. “By getting rid of this margin, it also allowed me to offer more affordable models,” continues Roland Murphy. “In the end, we reduced production and increased our margins. With the advent of the internet, we have really grown, especially thanks to the impact of social networks and the support of specialised blogs.” The watchmaker manages the Instagram account of his brand himself. A region forgetting its horological past With his experience as a restorer, the watchmaker doesn’t want to hear about using silicon in his calibres: “When I think of a watch, I think of its repair in several decades’ time. Too few brands take this into account. This is also why independents are so popular with collectors. We’re dealing with humans, not technocrats.” Roland Murphy's succession seems to be assured, since his sonin-law works for the company, and his son has just graduated with a specialisation in CNC operations. The citizens of his region are no longer exposed to the importance of the watchmaking industry, however. “Many people are unaware of the long industrial and watchmaking heritage of our territory, despite the presence of the National Museum of Watchmakers and Clockmakers.” So, with his good humour and sincere speech, Roland Murphy acts as a salutary reminder, which may lead to new vocations among those whose grandparents devoted their lives to watchmaking. The glory days of American watchmaking When he visited the World’s Fair in Philadelphia in 1876, Swiss watchmaker Jacques David was alarmed by the rapid growth of American industry. His letter to his colleagues remains famous, as it triggered a strong wave of modernisation in the Swiss industry. We take a look back at the most successful years of the Made in USA watch. Shinola – timepieces, cola and bedrooms The Detroit firm is a symbol in the American industrial city. Thanks to its partnership with Ronda and a network of own-brand stores, it has managed to make a name for itself in the cool and young quartz watch segment in the United States. The opening of a hotel in its home town accentuates its lifestyle aspect. Shinola is now introducing new lines equipped with mechanical calibres. After watches, bikes, notebooks and record-players, it’s the turn of loudspeakers and headphones, as well as a hotel and a brand of cola. After all, why should a watch brand restrict itself to its primary mission, especially if its groove is lifestyle? Shinola, launched in 2011 by Tom Kartsotis (the co-founder of Fossil), has taken things to an extreme, since it is has just opened its first hotel in Detroit. States. The best-selling lines are the Bedrock and the Runwell, with prices ranging from USD 550 to 2,200. The brand has so far produced almost exclusively quartz watches, except for a few mechanical series in limited editions. And quite naturally so, since the Shinola factory in Detroit, where the watches are assembled, was born of a partnership with a Swiss champion of quartz watches, Ronda. However, in 2019 it is launching an offensive on the automatic watch front, this time partnering with Sellita to supply calibres for the new Runwell Automatic timepieces. Today the company has no fewer than 28 proprietary boutiques in the US, from Boston to Honolulu. It is also distributed in several renowned stores in Europe, such as Le Bon Marché in Paris, and has opened its own store on the Old Continent, in London. a famous industrial design establishment, the College for Creative Studies, and does not hesitate to make use of its young talent. Not content with just reburnishing Detroit’s image, Shinola is now placing itself in the role of moral support-giver to immigrants, with its Statue of Liberty line, an extension of its Great Americans series and, first and foremost, a reference to a tense political context on this issue in the United States. The challenge facing Shinola will be to withstand the test of time, when the current predilection for ultraclassic, vintage lines starts to wane. What will happen the day when the hipsters shave off their beards and start looking ahead, towards more futuristic products once again? On that day, Shinola will have to be able to fall back on its natural elegance. The new Shinola Runwell Automatic is powered by a Sellita movement. Grand Seiko – the American bet The new deployment of the Japanese brand overseas starts with America. Seiko has opened the world’s first boutique dedicated exclusively to Grand Seiko in Beverly Hills. It has also launched a series of limited editions for the US market. Interview with the American management. Grand Seiko, previously Seiko‘s upscale collection, has broken away from the parent company to become a fully-fledged brand in its own right. This is part of an ambition to conquer a bigger share of the global Haute Horlogerie market. In Japan itself, Grand Seiko was already renowned for the finesse of its design and the precision of its calibres. But elsewhere in the world, and especially in the United States, the name “Seiko” was mostly associated with entry-level watches, since the quartz revolution that saw the Japanese brand conquer the planet. It was to correct this narrow vision of the breadth of the company’s offering that Grand Seiko freed itself. And it is naturally in the United States that the first effects have been felt the quickest. No coincidence, then, if the world’s first Grand Seiko Boutique was inaugurated in Los Angeles, on Rodeo Drive in Beverly Hills. 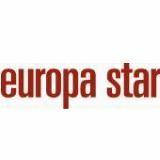 Europa Star had the opportunity to speak with two key figures about the development of the new entity in the United States: Akio Naito, Chairman and CEO of Grand Seiko Corporation of America, and Brice Le Troadec, Brand President of Grand Seiko America. global ambition of Grand Seiko seems to have found fertile ground in the United States… Akio Naito: Indeed, the new strategy makes sense here. We have to catch up with all the potential that has not yet been deployed by Grand Seiko in the luxury market in the past, especially in the United States. Grand Seiko, born in 1960, had until now been almost exclusively promoted in the Japanese domestic market. When the company decided to expand internationally, it did so first through its production of affordable watches and not its more luxurious ranges. That’s why, even today and excluding Japan, a majority of people associate the name Seiko with an affordable brand. In the United States, the average price of a Seiko remains less than half of that in Japan! Brice Le Troadec: We are very pleased with the first results of this strategic decision to make Grand Seiko a brand apart. Collectors who already know the brand are our first customers, but we intend to gradually expand this base to a wider audience. US retailers are very excited! We are delighted to see so many new customers interested in Grand Seiko. The United States is already the biggest market for Grand Seiko outside of Japan. You have opened a Grand Seiko store in Los Angeles and have Seiko stores in New York and Miami. What is your strategy for the distribution of Grand Seiko in the United States, especially in terms of the difference between retail and wholesale networks? A series of limited-edition Grand Seiko Spring Drive models have been launched for the American market. The "Kara-zuri" dial is inspired by ukiyo-e paintings and the textures featured in portraits of Kabuki actors. tion. We are also proud of our partnership with Hodinkee, who have a successful e-shop. Akio Naito: The flagship store inaugurated in Beverly Hills is part of our new strategy, because it allows us to control our image in order to deepen this market. However, the idea is not to multiply brand stores. The wholesale network is our priority. Our goal is to have approximately sixty Grand Seiko partners of high quality in the United States. The United States remains a stronghold of brands like Rolex and Breitling. How do you intend to convince American buyers? are particularly appreciated by the new entrepreneurs of Silicon Valley, and have a very strong appreciation from watch connoisseurs who understand the intense craftsmanship with which the brand has become synonymous. Brice Le Troadec: We have launched three Grand Seiko Spring Drive models reserved for the American market, with very original finishes and motifs on the dial, introduced as “Kabuki Kimono” dials. The dial texture is inspired by the Karazuri “empty printing” technique used in the texture of the kimonos worn by actors in Kabuki theatre. We are counting on these limited series of the 44G line, which have been very well received, to increase our brand recognition in the United States. pushing Leon Adams and others like him to get closer to smaller, more exclusive brands with whom dialogue is easier. Romain Gauthier, MB&F, Greubel Forsey, H. Moser & Cie, Laurent Ferrier and, very recently, Grönefeld. London Jewelers: everything for the family The fourth generation of the Udell family has arrived at the Long Island retailer, which has also expanded into Manhattan. Deeply rooted in its community, it has created its own “artery of luxury” on Long Island, an alignment of boutiques combining watchmaking and jewellery, as well as multi- and mono-brand stores. If we could only mention one historical family watch retailer in the United States, it would probably be London Jewelers on Long Island. It’s simple: we met the whole family, the third and fourth generation, and each member took turns telling their story, with strictly rationed speaking time. After more than 90 years in business, London Jewelers has boutiques in Manhasset, Greenvale, Glen Cove, East Hampton and Southampton on Long Island, as well as in the Oculus at Westfield World Trade Center, in Manhattan. The retailer has created a unique boutique alignment in Manhasset, where it operates a true “artery of luxury”: a multi-brand store, a Van Cleef & Arpels boutique, a Chanel boutique, a David Yurman boutique, a Cartier boutique, and an innovative bridal concept boutique exist side by side. focuses primarily on strong personal relationships with its sophisticated clientele: “Our advantage is hands-on local service rather than digital distance. Touch and feel has never been more important than it is today,” says Mark Udell. Above all, the brand can count on a territory with a well-off and loyal clientele, where it is very dominant. “The market is very healthy,” notes watch specialist Zachary Udell. “We are addressing a clientele that is looking for a relationship of trust.” About 65% of turnover is based on jewellery. One of the biggest challenges in selling watches, as is the case for many luxury retailers today, is access to the product, notably the most sought-after models by Rolex and Patek Philippe. Kong and Macau, an extremely dangerous journey, his father settled in the United States in 1980 as a jewellery distributor. store dedicated to jewellery. Stephen Silver’s son continues: “I saw all the development potential that exists in the region with watchmaking, in order to reach a male clientele. Finally, in 2014, we opened a watch store, which from the beginning accepted crypto-currencies as a means of payment.” Most of the customers are young, with strong purchasing power, already collectors, with a pronounced taste for the exclusive and disruptive luxury segment. “Of course, they are very active people who travel a lot and could buy watches anywhere in the world, but we offer two advantages: a solid inventory and a responsive local service,” explains Jared Silver. Tiny Jewel Box: everything for the political elite Since Roosevelt in the 1930s, the American political establishment has been buying jewellery from a specific retailer: Tiny Jewel Box. This historic address in Washington DC successfully added watches to its portfolio in 2001. “We’re always very happy when we get a call from 1600 Pennsylvania Avenue.” Matthew Rosenheim has a rare privilege in the watch industry: the president and owner of the Tiny Jewel Box boutique, which has sold timepieces for 17 years, is Rolex’s exclusive representative in central Washington DC – the most internationally sought-after brand, in the political heart of the most powerful country on the planet. While many fear for the survival of the “bricksand-mortar” model, such a competitive advantage is difficult to beat. “In many ways, and despite all the technological developments, my job remains very similar to that of my grandparents,” Matthew Rosenheim emphasises. “We do business based on human relations. Of course, we develop new strategies, but sometimes the simplest things work best.” Here, each new product entry is meticulously thought out by the Rosenheim family. fringe of watchmaking clientele that is not necessarily ready to adhere to the concept of a single-brand boutique. The concept of ‘brand loyalty’ is now more in question than ever,” says Matthew Rosenheim. Over and above the advantages of its location, it was Tiny Jewel Box’s cautious and highly selective strategy that paid off. Initially a jeweller, the company expanded into watchmaking quite late, at the turn of the year 2000. It has since caught up quickly, forging successive partnerships with Rolex in 2001, Cartier in 2015 (which coincided with the expansion of the boutique, taking over premises previously occupied by Burberry, and freeing up a lot of space for the new watchmaking section) and Patek Philippe in 2016. Sporting timepieces with a disruptive design or covered with precious materials do not necessarily fit in with the electoral base and the public service mission of its representatives. The word “understatement” takes on its full meaning here – and has nothing to do with purchasing power... “Here, the local currency is not money, but your network, who will take your call or not!” Matthew Rosenheim points out. presented Laura Bush with a gift from Tiny Jewel Box. A vintage brooch that the Obamas presented to the Queen of England in 2011 also came from there. In addition to customers and institutions from the political world, the shop also attracts businessmen visiting the American capital. The demographic structure of the city itself is changing. While the middle to wealthy classes settled in the suburbs from the 1960s onwards, as they did in many other American cities, we are now witnessing the opposite phenomenon, with the corollary of a real estate boom. Washington is gentrifying. nearly half of the market, with an annual turnover of approximately $110 million in 2018. 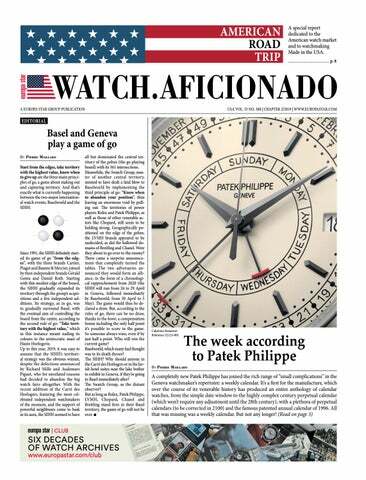 But it should be stressed that the so-called preowned watch market is much larger than the watch auction market. “It’s a big market for Rolex, Patek Philippe, Audemars Piguet and Omega - we hope Where does the United States fig- that interest in other ure in this market? brands will grow.” The United States is becoming a destination for watch auctions, but remains behind Geneva and Hong Kong, where we organise two sales per year, compared to only one for the moment in New York. I don’t think it’s time yet to consider launching a second annual sale, because it is not easy to find enough watches that meet our quality requirements to make a satisfactory auction. How important is America to your supply of vintage watches? true with the advent of online sales. There may be a different mindset between American collectors, who are often looking for the best deal, and Asian collectors, who will put a lot of financial resources into obtaining the best quality. Kong or Japan. This may be linked to the disappearance of the once flourishing American watch industry. It’s a big market for Rolex, Patek Philippe, Audemars Piguet and Omega, but beyond that, I don’t see very strong interest for other brands in the modern watch market. We hope that interest in watchmaking will grow. In this respect, we are ready to join our efforts with the brands themselves, which are increasingly highlighting their heritage. Our interests converge on this point. Indeed, brands are increasingly selling certified pre-owned timepieces themselves, alongside their contemporary creations. Could you see Phillips offering new watches alongside vintage models? Our own future could indeed combine vintage and contemporary watches, to become a “complete watchmaking destination”. But our short-term focus is to maintain solid financial performance, and to gradually build the best team of experts in the world. use. For example, Jaeger-LeCoultre has reduced its gyrotourbillon to wearable proportions, coupled it with a perpetual calendar which is adjustable in both directions, and is specifically enjoining future owners to wear it on an daily basis (a somewhat dangerous proposition, depending on where you go). Another example is Vacheron Constantin, which has come up with a brilliant innovation by presenting a perpetual calendar with two different regulators, one for when the watch is being worn and the other with a power reserve of up to two full months. That means you can leave your perpetual calendar in the drawer without worrying about it stopping and requiring a tedious readjustment. Vacheron Constantin Traditionnelle Twin Beat perpetual calendar A perpetual calendar is meant to show at least the hours, minutes, date, month and leap years up to 2100, theoretically without human intervention. Except that if it reaches the end of its power reserve and stops, you have to launch into a tedious re-setting operation. It's a problem that Vacheron Constantin recently solved with a stroke of genius. The solution? The name says it all: Twin Beat. The inspiration for it came from the Japanese clocks of the Edo period (1603 - 1868) in which day and night were divided into six segments of differing durations, which varied with the seasons. These clocks were equipped with simple or double foliot balances that enabled their speed of operation to be modified. So how could this kind of functionality be translated into a wristwatch? Two distinct balance wheels The Traditionnelle Twin Beat perpetual calendar is equipped with a double barrel and two mainsprings that transmit their energy to two distinct gear trains powering two equally distinct regulating organs functioning at two distinct frequencies. There is the “Active” mode, with a high-frequency oscillator at 5Hz (36,000 vibrations/h), offering a power reserve of four days; and the “Standby” mode, with a low-frequency oscillator vibrating at 1.2Hz (8,640 vibrations/h), offering a power reserve of at least 65 days! With the aid of a simple push button at 8 o’clock, the user can switch from one mode to the other according to whether they are wearing it – at 5Hz the watch keeps perfect time regardless of any brusque movements by the wearer – or are leaving it rest in low-frequency mode. In that case, it only requires rewinding manually once every two months. Placed at the top of the dial, the power reserve is unique: depending on whether the chosen mode is Active or Standby, a single needle automatically displays 4 or 65 days. The most pertinent of all perpetual calendars When you transition from one mode to another, there is no lag in the time display and calendar indications, thanks to an instantaneous switching system that stops one oscillator at the exact instant that the other starts, an operation that takes a fraction of a second. At the heart of this highly innovative system is a differential that allows the hands to draw variable information from two gear trains for one reading of the time, whatever the selected mode. A second differential, mounted on the barrel, applies a suitable amount of torque to the Standby balance, the very fine and ultra-sensitive hairspring of which (its section much finer than that of a human hair) was specially designed for this very slow beat. Lastly, two supplementary differentials provide the information specific to the single hand that indicates one of the two power reserves. The 480 components of this calibre 3160 QP are contained in a space 6mm thick and 32mm in diameter. A real feat. CHF 210,000 THE VACHERON CONSTANTIN TRADITIONNELLE Twin Beat perpetual calendar has Geneva Hallmark certification and comes in a classic platinum case 42mm in diameter and 12.3mm thick, which contrasts with its highly contemporary-looking, duallevel skeleton dial decorated with a radial guilloché and sand-blasted finish. Close-up view of the twin oscillators at the back of the watch Left, the Active-mode 5Hz oscillator; right, the Standby-mode oscillator. Recognisable by its large diameter and slow beat, its more delicate hairspring is four times smaller in cross-section. Note also that this same calibre has a new, instantaneous jumping mechanism for the date, month and leap year indications that reduces the effect of the jump on the amplitude of the oscillator. Hermès Arceau L’Heure De La Lune With its Le temps suspendu watch in particular, which has become uniquely emblematic of a manner of playing poetically and philosophically with the very notion of time, Hermès has built up a horological territory of expression unlike any other. The new Arceau L’Heure De La Lune fully conforms to this whimsical trope which reinvents or reinterprets watch functions in a playful and dreamlike fashion. This moonphase, or double moonphase to be more accurate, in its own unique way revisits and transfigures one of the most explored indications in watchmaking. The new Arceau L’Heure De La Lune simultaneously displays the phases of the moon in the northern and southern hemispheres, playing havoc with our vision of things from the outset by placing South at the top and North at the bottom. And rather than being placed in an aperture, or even orbiting the Earth, the two moons stay put, and it is the two “Earths” – two mobile counters, one displaying the hour and minutes and the other the date on our home planet – that orbit, concealing or revealing the moon discs. All this while maintaining a horizontal reading position. The two counters are placed on a mobile chassis that literally hovers above the meteorite or aventurine dial in which the two mother-ofpearl moons are set as if in the cosmos, and completes one revolution every 59 days. This technical feat, brilliantly accomplished by JeanFrançois Mojon (Chronode) and powered by the Hermès in-house Calibre H1837 (produced in collaboration with Vaucher Manufacture, in which Hermès is a stakeholder) is enclosed in an exclusive mechanical module, it alone made up of 117 components. “The principal technical challenges lay in the wheel train transmission system and the planetary gears, and in finding suitable materials,” J.-F. Mojon explains. Available in two series limited to 100 each. It is mounted on a matte graphite or abyss blue alligator strap with a white gold folding clasp. Automatic movement, sapphire crystal and caseback. 43mm white gold case. What a diabolically clever man, this Richard Mille. While for most watchmakers, the arts and crafts perpetuate a very outdated, eighteenthcentury-style iconography made up of flowers, wild animals and bucolic landscapes, here he is, opening up a bright, pop-arty and psychedeliccoloured candy jar. Lollipops, marshmallows, cupcakes, liquorice, bilberries, lychees, cherries, kiwis, strawberries, lemons – before our very eyes an explosion of 60 dazzling colours across 10 different models: 4 Sweets and 6 Fruits. Take a basket and pick and mix. On condition, it must be pointed out, that you’re the kid of very rich parents. These little treats, 300 in all, weigh between CHF 106,000 and 157,000 each. Some have up to 16 sweets and fruits per dial. All in relief and of breathtaking micro-realism. While for most watchmakers, the arts and crafts perpetuate a very outdated, eighteenth-century-style iconography, Richard Mille is opening up a bright, pop-arty and psychedeliccoloured candy jar. Say what one will, Richard the Candy Man is way ahead of the rest of planet Horology. This said, he’s no stranger to colours, materials and textures. He has played with them in an extremely disciplined manner since his debut in 1999, from the outset combining visibly avant-garde mechanical architecture with research into materials. Hence the colours. And when Richard Mille does something, he does not do it by halves. Developing one single colour/texture/material – for example, imitating with precious exactitude the texture of a liquorice wheel – “takes us a year and demands an investment of over 100,000 francs” they tell us, with the utmost seriousness. As if made to measure for twentyfirst-century Marie-Antoinettes (100% motorised in consequence), these contemporary fine-art candies make their co-exhibits, vaunting their butterflies from a bygone age, look positively antiquated. No doubt some shrewd opportunists will soon be jumping on this bandwagon, which is already “trending”. To prove the point: the Bonbons (of which there are 300 in all, remember) are already sold out. Guy Sémon* speaks about the highly innovative carbon nanotube hairspring of the TAG Heuer Carrera Calibre HEUER 02T Tourbillon Nanograph Carbon nanotubes are used to produce a new type of hairspring. CARRERA HEUER 02T TOURBILLON NANOGRAPH TAG Heuer Calibre Heuer 02T tourbillon manufacture movement with new inhouse hairspring made of carbon composite, diameter 31mm, 33 jewels, balance oscillating at a frequency of 28,000 vibrations per hour (4Hz), 65-hour power reserve. Chronometer certified automatic tourbillon chronograph: hour and minute counters; tourbillon, hour, minute and seconds. 45mm case and lugs in black PVD titanium, carbon bezel with tachymeter scale, sapphire crystal with anti-reflective treatment on both sides, water-resistant to 100 metres (10 bar). Black open-worked dial with hexagon pattern, black flange with 60 seconds scale, black-gold plated chronograph minute and hour counters and tourbillon frame, rhodium-plated indexes and hands filled with SuperLuminova®, hexagon pattern. Price: CHF 24,900. Special packaging with integrated watch winder. highest section of the tilted case, the hours and minutes are displayed off-centre, with a particularly high hand-fitting. Above this suspended dial is a moon phase in the shape of an engraved dome, into which are set two circular aventurine glass plates (the moon of the northern and southern hemispheres). Above these are two circular apertures that indicate the moon’s phases. Placed at 4 o’clock, the power reserve indicator is a crescent-shaped gauge, while at 8 o’clock a large date appears in a circular aperture, the mechanism of which is visible. Dimier “writing desk” case, 48mm x 15.50mm, in sapphire with titanium lugs and caseback. Full grain alligator strap with 18K white gold pin buckle. Water resistance 30m. Hours, minutes, seconds on tourbillon, big date, power reserve indicator, hemispherical moon phase indicator. Guarantee 5 years. Three patents: spherical winding system, tri-dimensional toothing with multiple gearing. Doubleface flying tourbillon. Jaeger-LeCoultre gets straight to the point: “We have created a truly wearable Gyrotourbillon, bringing high complication out of the watch safe and onto the wrist for everyday enjoyment.” That said, before wearing it on your wrist and venturing out into the dangerous urban jungle, you will have had to open your safe and withdraw 800,000 francs. And hire a bodyguard. But the watch itself, strong on aesthetics yet relatively discreet, is truly amazing. We have been familiar with the highly sculptural and kinetic multiaxis Gyrotourbillon since 2004, but here it is again with much-reduced dimensions to allow it to cohabit with a Westminster carillon minute repeater and a perpetual calendar. All of this fits into what is indeed a perfectly wearable case, 43mm in diameter and 14.8mm high. Not overtly hubristic, it sums up in a nutshell a long series of improvements over the years aimed at chronometric precision, sound quality and gong volume, and at simplifying the use of a perpetual calendar. Its chronometric precision is backed up by a constant-force mechanism. The remontoir d’égalité, which is periodically re-armed by the barrel mainspring, acts as an energy regulator. By regulating the minute wheel, it creates a more precise jumping minute hand that eliminates any possibility of a cadence error. The euphony of the four famous notes of the Westminster chime is achieved through a combination of several other advances: there are no delays in the hour, quarter and minute strikes; the square crosssection gongs welded directly to the crystal, which acts as a sound board, provide an exemplary sound. The trebuchet hammers, an exclusivity already seen in previous watches, deliver precise, clean strikes. The perpetual calendar, which displays the date by means of a central hand with a red pointer and the day, month and year (in whole figures) in apertures, can be set both forwards and backwards – a detail which may appear insignificant but which is complex to build and above all, highly appreciable if the watch, which has a power reserve of 50 hours, has stopped because it hasn’t been rewound. So to prevent any unwelcome surprises, it’s better to wear it. White gold case 43mm x 14.08mm. Calibre 184 – manual. Water resistance: 3 bar. Hour/Minute, jumping date, twoway perpetual calendar (day/date/month/ year), Gyrotourbillon, minute repeater with Westminster chime. Power reserve: 50 h. Dial: blue guilloché enamel or silver grained. Caseback: open. Limited to 18 pieces. Hours and minutes at 3 o’clock, small second at 6 o’clock, power reserve at 12 o’clock, vertical tourbillon at 9 o’clock. Power reserve 80 hours ± 2h. Manual winding calibre 1519 / 29 turns of crown. Platinum PT 950 or 18K 6N gold case 42 mm by 13.60 mm. Movement in 18K rose 4N gold with hour dial in enamel on white gold. Highquality finish: guilloché Clous de Paris on bridges, circular Côtes de Genève on base plate, screw heads polished and bevelled. CHANEL BOY·FRIEND TWEED ART What is more different than tweed and enamel? One consists of supple, warm, coarsely woven wool, the other of hard and fragile metal plates painted layer by layer and baked in the oven. They are worlds apart, but if anyone is capable of reconciling them, it is Chanel. The texture and colours of tweed were the inspiration for a beautifully delicate, abstract painting in cloisonné grand feu enamel. It is framed by beige 18-carat gold and mounted on a satin strap. Perfection. Large model (37 x 28.6 x 7.75 mm) Limited edition of 20 pieces. Manual-winding mechanical movement. Waterproof down to 30 metres. Price not communicated. TRILOBE LES MATINAUX SÉRIE INAUGURALE “Ride your luck, seize your joy and confront your risk. To witness you will see them converted.” René Char, Les Matinaux. It is rare for a watchmaker to quote a poet as demanding as René Char to “sum up the spirit in which Gautier Massoneau created Trilobe”. Seeing this watch is certain to convert you to this way of reading the time, which is innovative, elegant and, in its own way, classic, as is its geometry and trefoil motif. The movement was designed by the acclaimed Swiss master-watchmaker JeanFrançois Mojon. This inaugural series consists of 100 numbered pieces – and the venture “is only just beginning”. 41.5mm steel case. 2892 selfwinding movement with an additional module. Introductory price: €7320 incl. tax. LOUIS VUITTON TAMBOUR SPIN TIME AIR The hour is displayed by twelve rotating cubes. Each time the hour changes, two cubes revolve instantaneously to hide the hour that has passed and to reveal the new. This concept, developed in 2009, is given a gossamer-light and bejewelled makeover thanks to a new automatic calibre placed in a “container” suspended at the centre of the watch. Seven models in white gold, 42.5mm in diameter, set with diamonds or coloured stones, lacquered or satin-brushed. Original and fun. Price not communicated. MUSE WATCH Never before has time been displayed like this: by the intermediary of finely worked geometrical compositions in perpetual motion (broken down into hours, minutes and seconds), the motifs of which are inspired by fractals. The creators of this new brand are two experienced watch engineers based in the canton of Vaud, whose aim is to “offer genuine living art”. Featuring automatic ETA 2276 “collector” movements, which were produced from 1969 to 1989, dials in natural stone and titanium cases (37mm or 44mm), they sell at prices ranging from CHF2,690 to CHF 2,990. JEAN MARCEL TANTUM GRAND SEIKO URUSHI With its amber-coloured (or black, once mixed with iron) dial in Urushi lacquer sourced from trees near the Shizukuishi Watch Centre, where some of Seiko’s most advanced watchmakers work, its case polished using a new technique of the traditional Zaratsu method, which accentuates the beauty of its curved surfaces, and its sapphire glass, also curved, the Grand Seiko Urushi reaffirms the deeply Japanese identity of an otherwise global watchmaker. The new automatic calibre 9S63 that drives it, with a delicate small-seconds dial at 9 o’clock and power reserve (72 hours) at 3 o’clock, is accurate to +5 or -3 seconds a day. Three limited editions (rose gold (150), yellow gold (150) and stainless steel (1,500)), sell at between $7,400 and $29,000. Time is the ultimate master.